Elite Crete Atlanta offers many of the popular enhancements for concrete on the market today. 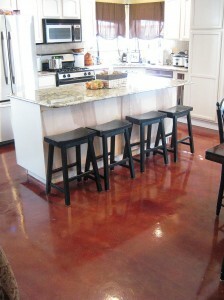 The most requested are staining (acid or water based), decorative overlays, and Polished Concrete. The most important item when thinking about these different options is the current condition of the slab. During our site visit we can determine the condition and offer the different possibilities with your concrete. Elite Crete Atlanta and Peak Floor Solutions are an authorized factory trained Elite Crete Systems installation company. One of the most popular enhancements that can be performed on an existing concrete surface is an overlay. They can be done in varying thicknesses depending on what type of finish you want to achieve. This allows for covering severe staining, carpet tack strip holes, and any other defect that is currently drawing the eye. With proper surface preparations these products cure to a hardness which exceeds your current concrete and give a lifetime of service. MICRO-FINISH™ Seamless Floors: Applied to existing concrete less than 1/16″ thick and literally as smooth as glass. Patterns, colors and design themes are absolutely limitless. Seamless 1/4″ Thin Stamped Overlay: Creates a light natural looking stone texture. Grout lines to replicate stone, tile, slate, etc. can be added for addition design options. Modified Slate Trowel Overlay: A smoother version of the conventional Slate Trowel Overlay for interior and exterior uses. Broom finish: Textured similar to an original driveway for maximum slip resistance. Splatter Texture Overlay: Applied approximately 1/16″ to 1/8″ thick to existing concrete to create a non-slip texture. Can be applied as plain gray or unlimited color and design choices. Patterns can replicate that of brick, stone, slate, tile, etc. Ideal for pool decks, water parks, public restrooms or locker rooms where water may be present but a non-slip finish is required. All of these toppings are designed to rejuvenate concrete by covering the existing surface (after proper preparation), providing consistent color and allowing for decorative treatments and finishes. It is the perfect way to even out cracked, chipped, stained and even mismatched concrete. It gives your old concrete a new life.